The D400 is a high quality wind generator widely acknowledged as the ‘gold standard’ for cruising yachtsmen. D400 features innovative and robust engineering, and is by design exceptionally quiet and vibration-free in operation. It is also the most powerful wind turbine available at its rotor size. The DuoGen 3 combined water and wind generator and offers truly practical solution for power generation while on passage and at anchor. The change from water to wind mode is fast, simple and requires no tools. Sail-Gen is powerful dedicated water generator specifically designed for cruising yachtsmen. Water generation is unbeatable on passage and Sail-Gen offers exceptional performance and ease of use. Supplied complete with mount hardware, Sail-Gen is a must if you are planning an ocean passage. StealthGen is a grid tied micro wind generation system for installation on domestic and commercial buildings. 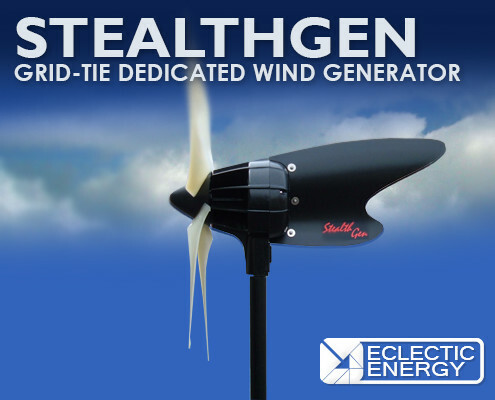 Using a variant of Eclectics well proven D400 wind turbine the StealthGen system is a practical product to compliment photovoltaic panels as part of a micro generation system. 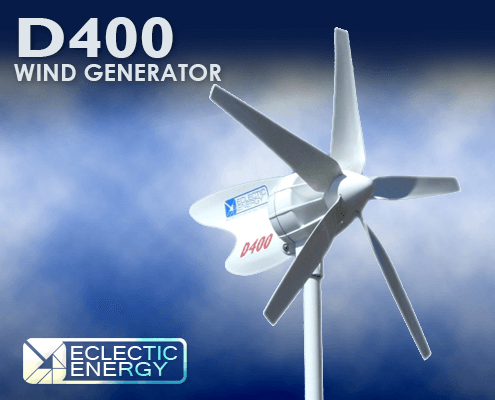 The D400 is a dedicated wind generator, designed for a variety of marine, rooftop or terrestrial applications. It is exceptionally quiet and vibration-free in operation and is also the most efficient and powerful wind generator available at its rotor size. The DuoGen is purpose designed to provide a truly practical solution to battery charging on cruising yachts. 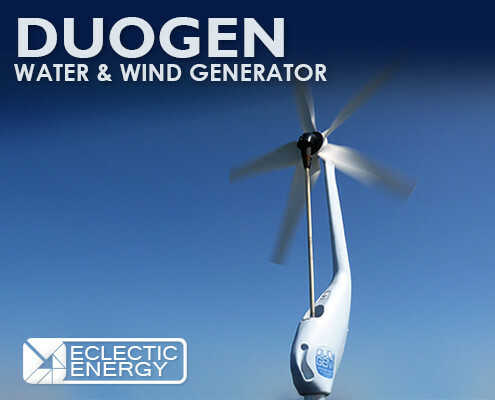 DuoGen’s dual mode capability allows the same machine to operate as a wind powered generator in harbour and a water powered generator on passage. Changing modes takes seconds and requires no tools. 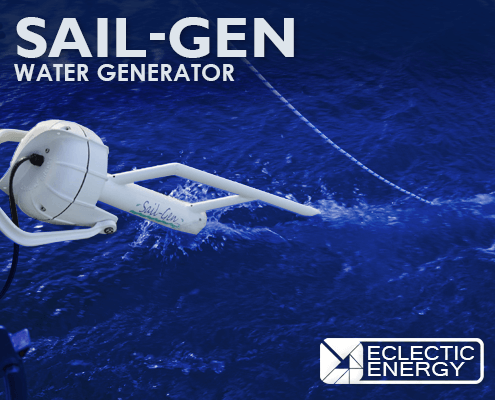 The Sail-Gen is a dedicated water powered generator specially designed for yachtsmen wishing to maximise their power generation while on passage. At normal passage speeds Sail-Gen will match typical consumption and is extremely easy to deploy and recover. The StealthGen system is designed to produce grid synchronised AC allowing direct connection to a buildings ring main. Based on a modified D400 wind generator StealthGen can form part of a domestic or commercial micro generation system. “Aventura passed through Bellot Strait on Friday (14th August) and we have thus completed the critical part of the Northwest Passage. We are now heading straight for Nuuk, Greenland. We congratulate Jimmy and his crew on a great achievement, and wish him safe sailing as he completes this difficult challenge. ‘Aventura IV’ is equipped with two D400s and a Sail-Gen which Jimmy tells us have been doing a great job providing plenty of power in support of this challenging venture. Eclectic Energy is delighted to be associated with Jimmy Cornell and the Blue Planet and Atlantic Odyssey sailing events. Jimmy Cornell, a prolific author and authority on long distance cruising, founded the Atlantic Rally for Cruisers (ARC) in the late 1980s. Jimmy has commissioned a brand new yacht, Aventura IV, from Garcia Yachting. Having designed Aventura IV as the ultimate long distance cruising yacht, Jimmy chose to equip it with Eclectic Energy’s D400 wind generator and Sail-Gen water generator. These units provide clean renewable electrical power both when the yacht is on passage and at anchor. Participants in either the Atlantic or Blue Planet Odyssey can obtain preferential pricing on Eclectic products. Call us now to discuss your own on-board power requirements. Eclectic offer unrivaled knowledge and expertise in the field of small scale renewable energy. We pride ourselves in providing the highest level of customer support and advice from our highly trained staff based in the heart of England. At Eclectic Energy we ship everyday from the United Kingdom to the destinations around the world. We accept all major debit/credit cards and paypal. The assembly instructions were clear and user friendly. Certainly laying the whole unit out on the floor and carrying a pre-fit of all parts was a good idea. When assembling the support brackets I replaced the RIVET you provide with an M5 pan head screw and nylok nut. The Duogen is fairly heavy when you are hanging it over the stern, a rope from the boom end worked well as a support mechanism allowing the alignment to be carried out with ease. The electrical system is easy with no difficulty in connecting up the wiring.